Featured Song "Burn Baby Burn"
"Tag Team Trouble" is the tenth episode of The Adventures of Super Mario Bros. 3; it aired alongside another episode of The Adventures of Super Mario Bros. 3 entitled "Dadzilla". Toad is carrying a large sack with several dollar signs on it through the Mushroom Kingdom, when he places it down to catch his breath. Toad comments to himself that the next time Princess Toadstool needs someone to deliver one-million Gold Coins to the Mushroom Orphange, he'll be on vacation. Nearby, King Koopa and Cheatsy Koopa are walking through the Mushroom Kingdom, holding a flyer. Koopa tells Cheatsy to follow his plan, so that they will be rolling in easy money. Toad overhears this, and assuming that the Koopas are after his money, he picks up the sack and flees. Cheatsy notices Toad and tries to tell his father, but Koopa tells him to shut up and pay attention. As Toad dodges some fireballs from a Venus Fire Trap, Cheatsy tries to get his attention again, but Koopa throws the flier down, yells at him, and drags his son away. Toad soon arrives at the orphanage and rings the doorbell. Exhausted from carrying the sack, Toad falls asleep right before a Mushroom Nanny and two Mushroom kids answer the door. The kids laugh at Toad sleeping, but the nanny tells them not to laugh, and that the orphanage needs the money to stay open. Without waking Toad, the nanny and the kids bring the money inside, and the nanny thanks him. 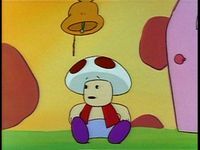 Toad, realizing the sack is gone. When Toad wakes up, he realizes that the sack is gone, and concludes that Koopa had stolen it while he napped. Toad figures that he will have to make up for the lost money someway, and walks home. Along the way, he picks up the flyer that Koopa dropped, and sees that it's promoting the Mushroom Wrestling Federation's Tag Team Wrestling Tournament. Uninterested, Toad throws the flyer into a garbage can, just as something on the flyer catches his attention: first prize is one million gold coins. Needing a wrestling team to enter the tournament for him, Toad presents the flyer to his cousins, The Mushroom Marauder and Jake "The Crusher" Fungi. The cousins agree and head to the arena with Toad to sign up for the tournament. However, they are knocked off their feet by two Sledge Brothers. Cheatsy walks up to the front of the line and enters the Sledge Bros. in the tournament. Wanting revenge on the Sledge Brothers, the Mushroom Marauder and Jake roll into the Sledge Brothers, knocking them into Koopa and Cheatsy. Toad tells his cousins to save their strength for the match, explaining that they need to win. Koopa pushes the Sledge Brothers off of himself and Cheatsy, and Cheatsy laughs, figuring that his father's plan to have the Sledge Brothers. win the tournament is foolish. Koopa then yells at Cheatsy, telling him to make his plan work. Cheatsy, hypnotizing Toad's cousins, notice his shell being the same color as his skin. The next morning, Cheatsy sneaks into the Mushroom Castle and enters a room where The Mushroom Marauder and Jake are sleeping. Cheatsy holds the two wrestlers' eyes open with tape, and uses a pocket watch to hypnotize them. Under hypnosis, Cheatsy gets the wrestlers to stay asleep for two days. Cheatsy then removes the tape and leaves just as Toad enters the room carrying breakfast for his cousins. Toad tries to wake his cousins, first with yelling, and then by yelling through a megaphone, but to no avail. Toad continues to shout, and shakes his cousins, but is unable to wake them up. Princess Toadstool enters the room with Mario and Luigi, and she tells Toad not to worry about the match, and that there are more important things like the welfare of the Mushroom orphans. When Toad starts crying, Mario agrees to talk to him, and Princess Toadstool leaves the room shortly after Toad hopelessly runs to the bed where Jake is sleeping. Toad, after taking off his hat, telling Mario about his predicament. 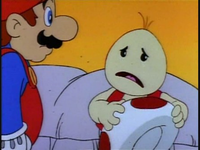 Toad takes off his cap and confesses to Mario that he needs to make up for the money that he supposedly lost to Koopa when he fell asleep in front of the orphanage. Mario wants to tell Princess Toadstool, but Toad tells him not to, because he doesn't want to lose her trust. Not knowing what to do now that his cousins won't be able win the prize money, Toad fears that the orphans will go hungry. Mario tells Toad that he and Luigi used to wrestle back when they lived in Brooklyn, and that they can win the prize money for him. Luigi comments that he's not one to volunteer to wrestle the Sledge Brothers, but Mario says that he'll volunteer for him, and that their team name will be the "Masked Mashers of Mayhem". Mario and Luigi work out before the tournament. First they do some stretches at a gym, where Mario also lifts a barbell consisting of two ? Blocks. Luigi then jump ropes up a series of Jump Block, while Mario follows behind, kicking them aside. Luigi then runs after Mario through an underground Warp Pipe, which takes them to Desert Land. Mario runs to the top of a pyramid before Luigi, and starts running down, but Luigi gets down faster thanks to a Rail Lift. Back at the gym, Mario finishes the workout by smashing through two formations of blocks. Luigi, shortly after the workout. Toad feels that Mario and Luigi may have overtrained during their workout, but Mario tells him not to worry, and that they will win the money that the orphans need. Luigi points out that the Sledge Brothers aren't aware of their plan (i.e. ; they'll get beaten). At the arena, the match is about to start, and the Sledge Brothers leap into the ring, knocking aside the Mushroom Referee, as he announces the two competing teams. King Koopa wonders who the Masked Mashers of Mayhem are, but Cheatsy soon notices that they are Mario and Luigi, but in spandex. Koopa feels confident that the Sledge Brothers can beat them, and tells Cheatsy to cheat. Cheatsy explains that he has already set booby traps all over the ring, but Koopa tells him to cheat some more, so Cheatsy starts the match prematurely by ringing the bell. With the fight now underway, one of the Sledge Brothers punches Mario into the cables at the side of the ring, but Mario bounces back and kicks him in the face. Mario jumps onto the cables, but Cheatsy, hiding out under the ring, tugs on the cables, and sends Mario flying into Koopa's lap. Mario tags Luigi, but before Luigi can enter the ring, Cheatsy causes him to get caught in the cables before being flung into the ring. Luigi tries to fight the Sledge Brother, but the Sledge Brother triggers one of Cheatsy's traps; a hole in the ring, for Luigi to fall into. Toad fears that Mario and Luigi will never win at this rate, so Princess Toadstool decides to get some help, and leaves. With Mario back in the ring, the Sledge Brother squirts him with some goop from a trap inside one of the sidebars, which hits Luigi as well. As Toad begs for Mario and Luigi to get up, the Sledge Brothers each pick up a Mario brother, and toss them into some blocks outside the ring. At that moment, Princess Toadstool returns with two Starmen, and throws them at Mario and Luigi, rendering them invincible. 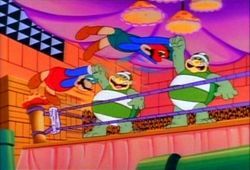 Right before the referee can proclaim the Sledge Brothers the winners, Mario and Luigi jump into the ring, and toss them around. The Sledge Brothers jump out of the ring, tag Koopa and Cheatsy, and flee. Mario and Luigi fling them around the ring via the cables until they hit each other and fall down. The referee then proclaims Mario and Luigi the winners, and just before he can award Mario and Luigi with the prize money, Toad takes it, and gives them his thanks. Toad returns to the orphanage with the prize money, and makes sure to stay awake when the nanny answers the door. 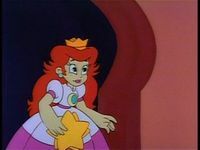 Upon receiving the money, the nanny tells Toad to give Princess Toadstool "double thanks" for her "double generosity", and closes the door on him. Toad then concludes that the money was never stolen in the first place, and faints when he realizes that he went through all that trouble for nothing. A Venus Fire Trap shooting fireballs at Toad. As King Koopa tells Cheatsy to follow his plan, his head messes up for a frame. When Cheatsy looks at the viewer for a brief second as Toad flees with the sack in the background, Toad's shoes are lavender. When Toad walks home trying to think of a way to make up for the money Koopa had stolen, he is shown taller than his usual size. When Toad throws away the flyer, he is shown smiling. In one scene where Toad tries to wake up his cousins, Toad has four spots on his cap rather than the usual three. As Toad begins to cry, his mouth is moved slightly downward for a frame. When Toad sobs, "You know all that money I was supposed to deliver to the orphanage? ", Mario responds, "Yeah? ", but his mouth is closed. When Mario says, "Oh no! ", his teeth are the same color as his skin. When the Sledge Brothers say "Tag, you're it! ", their mouths aren't moving. When Mario and Luigi become invincible, their wrestling costumes disappear for the remainder of the episode. Adding to that, they stop flashing before attacking the Sledge Brothers, yet remain invincible (as shown by the music). As Cheatsy is hypnotizing Toad's cousins, the rim of his shell is the same color as his skin, and appears to actually be fully-connected to it. When Toad tells his cousins, "I can't tell the Princess! I'm too ashamed! ", the flyer reads, "1st PRIZE 1,000,000 AID COIN°", as it was supposed to read, "1st PRIZE 1,000,000 GOLD COINS". When The Mushroom Marauder says, "Ya really wanna win this thing, don'tcha? ", Toad's cap color changes to yellow. When King Koopa says, "Get off, ya big oafs! ", one of the spikes on his left wrist chain disappears and reappears a few times. When King Koopa gets knocked down at the wrestling match, Cheatsy can be seen looking at him, even though he is still supposed to be under the arena. While King Koopa is talking to Cheatsy about claiming that the million gold coins will be his if the Sledge Brothers defeat the Mario Brothers, his arms and a part of his shell disappear and reappear a few times. When Luigi is about to wrestle one of the Sledge Brothers before falling in the first booby trap, the Sledge Brother's helmet is white. When Luigi is about to fall into the first booby trap in the wrestling match, his mask is the same color as his skin. 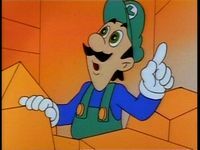 As Luigi falls in the first booby trap, Mario is seen in his normal clothes. Before the Mushroom referee announces Mario and Luigi winners, his head messes up for a frame. As Mario and Luigi grab Cheatsy and King Koopa, Cheatsy's eyes are light blue for a frame, while Luigi's cap is blue. When Princess Toadstool tells Toad not to worry about the wrestling match, her nose is missing, but when she walks up to him, her nose reappears. At the beginning of the wrestling match, the speed up jingle from when the time is running out in Super Mario Bros. 3 is played. This is one of the two episodes in the DiC Cartoons where Toad can be seen taking off his hat. The other is "The Bird! The Bird!" from The Super Mario Bros. Super Show! where he uses his hat as a parachute upon falling. 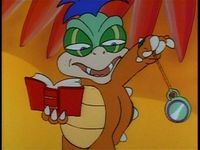 One of the syndicated versions of this episode (the version shown in the compilation series Captain N & the Video Game Masters) has the hypnotism scene shortened. In the shortened version, Cheatsy simply enters, moves the watch in front of the wrestlers, and leaves, with all of his lines in that scene removed. If the viewer looks where the nanny opens the door the first time, one of the Toads is dark-skinned. This is the first time ever in the series (games, comics and TV shows) a dark-skinned Toad is seen. In the original NBC airing of this episode which aired along side the Captain N episode "Trouble with Tetris", Toad narrates the teaser trailer promo for this episode saying "I lost a million gold coins meant for the Mushroom Kingdom orphans. Now the Mario Bros. have to wrestle the money back from the Koopas." This page was last edited on March 23, 2019, at 09:13.